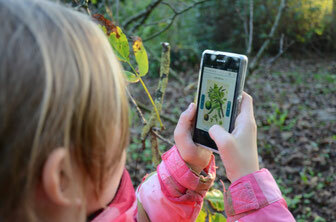 Finde Vielfalt - Experience Biodiversity With Geogames - biodivlbs Webseite! 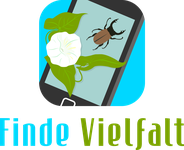 within the Project Finde Vielfalt location-based games (geogames) for families and teenager about biodiversity are developed by the University of Education Ludwigsburg in cooperation with the University Bamberg. As an implemention partner the "Deutsche Jugendherbergswerk" has contributed an area-wide realization of this project. Additionally in the project Finde Vielfalt will be researched, if a playful access to geogames can create perception and appreciation of biodiversity within children and teenager. The everyday life of children and teenager can no longer by imagined without mobile devices like smartphones and tablets. Nature and biodiversity on the other side is hardly noticed and its protection has been given little to no importance. That is the reason why accesses for mobile devices are developed to experience biodiversity and to learn to cherish its value. In the project Finde Vielfalt different geogames for different age groups are beeing developed. In the geogame Der Grüne Schatz families with 6-12 year old children can search for plants with special properties throughout Germany with a picture trading card game. Here you can learn more about Der Grüne Schatz. There is also a web page for your children about Der Grüne Schatz. 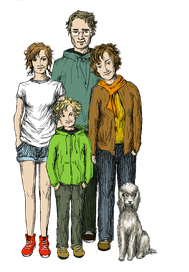 And family FindeViel (find a lot), the game family in Der Grüne Schatz introduce theirselves here. The game is available here for free as for iOS and Android. The Geogame Finde Vielfalt Simulation is a simulation game for pupils from class 7 and upwards, which challenges them to discover nature and puts the biodiversity at the centre of things. Within the game the predicament between economic interests and nature conservation objectives has to be solved. The teenager dives in into a game narrative, which leads them to real places in nature. The game will be playable at the Youth Hostels Germany-wide. Here you can find more about the game Finde Vielfalt Simulation. The game is currently under development. You will be informed on this homepage when it will be available at the youth hostels.